The Democracy Spring protests in DC are building the power needed to break our politics free of its corporate choke-hold. These and hundreds of other people I joined with several Institute for Policy Studies colleagues in a training, a rally, a march, and arrests on the steps of the Capitol on Wednesday were participating in their first direct actions as part of the Democracy Spring and Democracy Awakening protests that are drawing thousands of people to Washington, DC between April 11 and April 18. As several hundred of us marched into the plaza to the east of the Capitol building, the contrast between the protesters and hundreds of lobbyists in thousand dollar crisp black suits couldn’t have been more stark. Several hundred of the “suits” on Wednesday belonged to what restaurant workers from the Restaurant Opportunities Centers—United (ROC-United) refer to as “the other NRA.” This is one of the main corporate lobby groups corrupting our democracy. In recent years, according to Corporate Accountability International, these “suits” have contributed millions to members of Congress and, over the past quarter century, they have bludgeoned restaurant servers by keeping the federal tipped minimum wage stuck at the obscene below-poverty level of $2.13 an hour. At a rally in the shadow of a giant statue of Christopher Columbus in front of Washington’s Union Station, ROC-United’s co-director Fekkak Mamdouh, who lost 73 co-workers at the Window on the World restaurant in the World Trade Center on September 11, 2001, energized the crowd. He explained the racial hierarchy of the restaurant business, with lower-paid people of color “in the back of the restaurant,” and introduced us to the leaders of a fight for a $15 wage for all workers, including tipped workers, in Washington, DC. Other speakers reminded the crowd of the genocide of Columbus, of the colonial status of Washington DC, and of the racism of our criminal justice system. As roughly 80 of us sat baking in the midday sun on the steps of the building where Congress all too often does the bidding of the other NRA and the Fortune 500, ROC-United organizer Yasemin Ayarci patiently explained, one on one to soon-to-be-arrestees, how we could stand up to the power of the “other NRA.” She laid out ballot initiatives and legislative battles that were emerging up and down the east coast to fight for “One Fair Wage,” that would eliminate the historical discrimination against tipped workers, the majority of whom are women and people of color. As we left the Capitol after the arrests, I ran one last time into the family from Pennsylvania. “Our eyes were opened today to possibility,” said the mom, clearly proud of her children for participating in their first political action. New voices are being awakened. This weekend, the action spreads to a large teach-in, a rally for democracy at the Capitol, culminating in mass arrests on April 18. 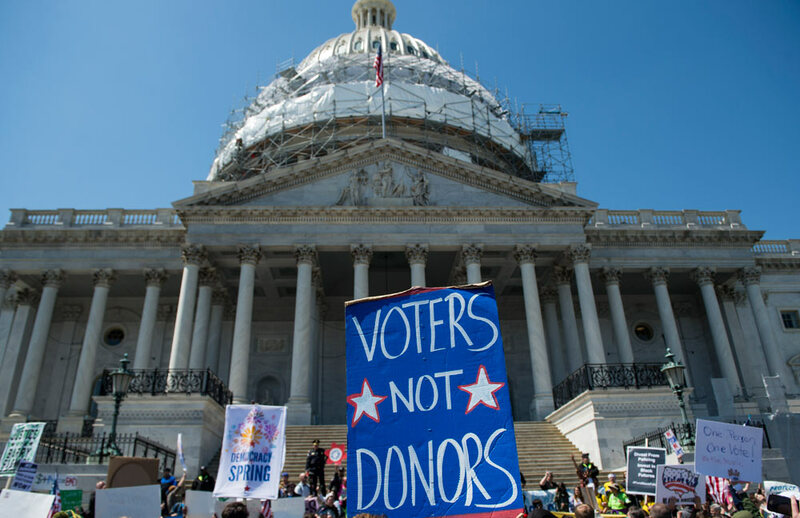 These actions are being organized by the incredibly broad Democracy Awakening coalition of organizations from labor, peace, environmental, student, racial justice, civil rights and money in politics reform movements. Can these groups, aided by the new people I met from Pennslyvania to Alabama to Washington State, build the power to transform the outrage building across this country into sustained power to defeat the corporate special interests choking our democracy? Join us to find out.